Spider-Man 3\r\nStarring Tobey Maguire and Kirsten Dunst. Directed by Sam Raimi. Written by Ivan Raimi and Alvin Sargent. Rated PG-13. The wall-crawler�s third film tries to do too much, but it�s fascinating all the same. The last shot of Spider-Man 2 was a close-up of MJ Watson (Kirsten Dunst) as she watched her beloved superhero web off into the distance, with mixed emotions all over her face. We knew then that the third movie in the franchise would be about their relationship, now that MJ knows that Spider-Man and Peter Parker (Tobey Maguire) are one and the same. Spider-Man 3 does expand on that, and perhaps should have stuck to it, even though its other subjects yield a lot of good material. The movie�s first big set piece is not an action sequence but a musical number, where MJ looks resplendent singing in a Broadway show, with Peter gazing at her adoringly from the front row. That�s as good as it gets for her, as she is majorly crapped on in this movie (which is only fair, given how many indignities Peter had to suffer in the first two films). The theater critics torch her performance and deal her acting career a major blow, while Peter is so caught up in Spider-Man�s growing fame that he barely notices. Then, Spidey saves the life of Gwen Stacy (Bryce Dallas Howard), a fashion model and the police chief�s daughter, who�s grateful enough to become the superhero�s number-one fan. Peter encourages Gwen�s advances and even re-enacts the famous upside-down kiss with her for press cameras and a cheering crowd. What a terrific way to trash the franchise�s signature moment � we feel as betrayed watching this as MJ does. The deterioration of Peter and MJ�s relationship is captured painfully well, never more so than in a restaurant scene when Peter�s attempt to propose marriage to her turns into a shambles. The chemistry between Maguire and Dunst has always been one of the series� strengths, and it deepens and grows more complicated as the characters� love for each other is severely tested. All the angst accompanying their breakup seems to build toward a climax worthy of a Wagner opera, so it�s frustrating that instead the movie culminates with MJ once again reduced to a helpless hostage while the action goes on around her. Those sequences, and most of the characters, are driven by revenge. Peter gets infected with some black extraterrestrial goo that changes his suit�s color and brings out his wrathful, vengeance-seeking side. This finds a convenient target in Flint Marko (Thomas Haden Church), the convict who killed his Uncle Ben and has now escaped from prison. Meanwhile, sleazy rival Daily Bugle photographer Eddie Brock (Topher Grace) wants revenge on Peter for stealing Gwen away from him and running him out of the Bugle. And Harry Osborn (James Franco) is still around, blaming Peter for his dad�s death. They�re all supervillain foils for Spider-Man, as Flint stumbles into a physics experiment and becomes the Sandman, Harry takes up his dad�s mantle as the Green Goblin, and Eddie gets the same black goo (a weak metaphor) on himself and turns into Venom. The storyline works wonders for Maguire, too. Whereas in Spider-Man 2 Peter was a young man cut off from his feelings, here he gets in touch with them and pays a price for it, along with everyone else. Maguire played a terrific dastardly villain in last year�s The Good German, and he�s similarly good here, particularly in a one-on-one confrontation with Harry. (�Your dad detested you. You were an embarrassment to him,� says Peter, and it�s cruel because it�s so true.) Through all this Peter remains essentially his dorky self, and though he dresses in fashionable clothes and tries to swagger like a badass, he only ends up looking weird and spastic. Making Peter funny in the depths of his unattractive behavior demands great skill from Maguire, and the actor not only manages to draw laughs but also keeps us on Peter�s side even when his bad self winds up hurting MJ. The attention to character is evident all through Spider-Man 3, even in the excellent comic relief scenes in the Daily Bugle newsroom. So many blockbuster action flicks give us too little plot and character that it seems peevish to criticize one that gives us too much. 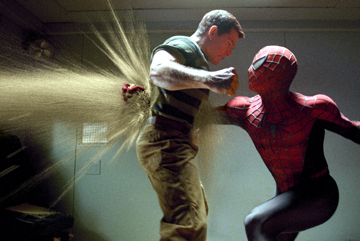 Nevertheless, Spider-Man 3 probably would have been better as two focused 80-minute films. The ambitious, overstuffed, and complicated 139-minute one that we have isn�t as well-proportioned as its predecessor, but it�s full of canny insights and bits that ring true. As for Peter and MJ�s epic romance for the ages, we�ll have to wait for a fourth movie for that.